DROID 2.2 to Start Rolling Out August 3rd? Starting 8/3, the Android 2.2 (Froyo) update for DROID by Motorola becomes available. 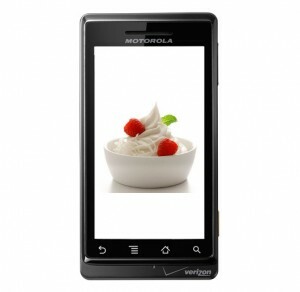 Starting 8/3/2010, Verizon Wireless introduces the Android 2.2 (Froyo) update for DROID by Motorola. The new Android 2.2 (Froyo) software update includes new enhancements and tons of shortcuts. It’s like downloading a new phone! New security options including remote device wipe and device lock, password complexity and minimum password length. Easily switch between the eight most recent applications. Rotate the screen 270 degrees to work with apps in any direction. Support Exchange calendars in the Calendar application. The update will be available to customers starting 8/3/2010. For more information and step-by-step instructions on how to perform the upgrade, please visit http://www.verizonwireless.com/droidsupport. As soon as we see an update.zip for this, we’ll be sure to post it. Stay close! You never know what could leak out in the next couple of days. DROID Froyo Test OTA Updates Start Tonight?